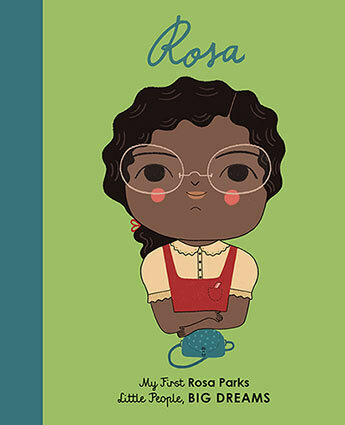 Part of the bestselling Little People, Big Dreams series, this board book version of Rosa Parks tells the inspiring story of the Mother of the Freedom Movement. This board book version of Rosa Parks - an international bestseller from the highly acclaimed Little People, Big Dreams series - introduces the youngest dreamers to the Mother of the Freedom Movement. Rosa Parks grew up in Alabama, where she learned to stand up for herself at an early age. Rosa went on to become a civil rights activist. In 1955, she refused to give up her seat to a white man on a segregated bus, sparking the Montgomery Bus Boycott. Her courageous decision had a huge impact on civil rights, eventually leading to the end of segregation on public transport. She never stopped working for equal rights. Babies and toddlers will love to snuggle as you read to them the engaging story of this fascinating icon, and will also enjoy exploring the stylish and quirky illustrations of this sturdy board book on their own. MARTA ANTELO graduated with a Fine Arts degree in Valencia, where she was born. After graduation, she moved to Madrid, where she works as a freelance illustrator. She brings delicate textures to her illustrations.